Here’s a look that’s as fresh as a newly-picked peach! Blanche features exotic stingray-textured faux leather with a totally unique, subtle snakeskin print overlay. 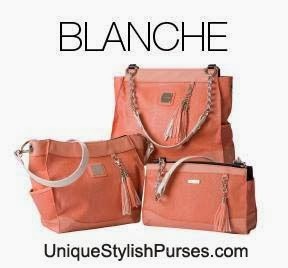 Reversed side-seams gives these Shells Miche bags a modern silhouette, and smooth peachy-pink faux leather accents with detachable tassels add undeniable elegance. Silver hardware and side pockets.